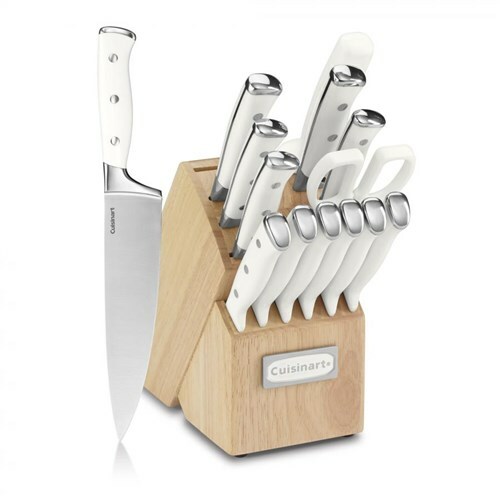 The Cuisinart C77WTR-15P is a 15-piece cutlery set that features precision-tapered blades for sharp, fine cuts. It has superior high-carbon stainless steel blades for precision and accuracy. The C77WTR-15P has an ergonomic handles for comfortable and balanced grip. Triple-riveted design of the set secures the full-tang blade to the handles. This set also features wide safety bolsters offering stability and control. The Cuisinart 15-Pc Wht Triple Rivet Cutlery has many exciting features for users of all types. 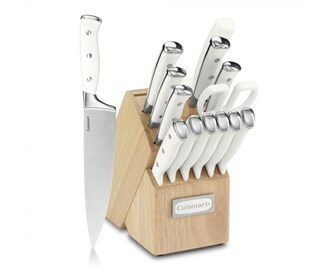 See the Cuisinart 15-Pc Wht Triple Rivet Cutlery gallery images above for more product views. The Cuisinart 15-Pc Wht Triple Rivet Cutlery is sold as a Brand New Unopened Item.